$49 for three months of unlimited access.Student, teacher, veteran, civil servant? Click here for special discounts! 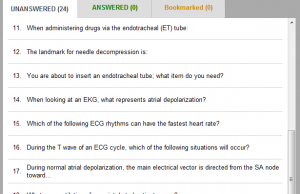 Designed for both the Advanced EMT exam and all EMT-Intermediates standard, every question comes paired with an answer that explains the answer and connects the theoretical EMT knowledge to real-world-applications. Each of our over 1200 practice questions was designed to simulate those found on the NREMT exams and each question and accompanying answers was written and edited by certified EMT experts, so you can be assured of accuracy and relevancy. 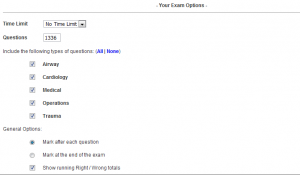 EMT Exam Ace provides you with multiple ways to study. In Study Mode you can go through the questions at your own pace, choosing to focus on the questions and topics that are most valuable to you. You can take a Practice Test, which simulates the question distribution, timing, and environment of a real NREMT Cognitive Exam. If you only have a few minutes to spare, you can take a Quick Quiz to get in some extra studying. Need to know about EKGs, intubation, needle decompression? We’ve got you covered! We have included a free section of questions like those you can expect in the Intermediate/99 and equivalent cognitive exams. EMT Exam Ace is perfect for preparing for the I/85 and I/99 exams and equivalents! EMT Exam Ace’s AEMT/EMT-I Cognitive Exam Preparation Package also includes exclusive access to glossaries and test taking tips. All of our material is available for unlimited 3-month individual access for only $49. Our EMT-Intermediate study materials are presented using TestConquest‘s state-of-the art learning management system. We are 100% confident that by using our materials you will pass your exam. If not, we’ll extend your account until you do. That’s our guarantee!